GRAITEC, an international BIM and CAD software developer for AEC, and Autodesk® Platinum Partner in US and across Europe, is delighted to announce the launch of Advance PowerPack for Autodesk® Revit® 2018, compatible with both Autodesk® Revit® 2017 and 2018. A full overview of Revit PowerPack 2018 new functionality can be found in the PowerPack for Revit 2018 What’s New document. Joseph Pais, GRAITEC Products Director adds: “We are constantly encouraged by the excellent feedback and productivity gains reported by Revit PowerPack users around the globe. The latest enhancements and new functionality that Revit PowerPack 2018 delivers stem from the proactive and rapidly growing community of users. Our vision match with our customers will help make Graitec Revit PowerPack the most powerful set of productivity tools available for Revit users in keeping with our strategy to become a global leading BIM provider and combining Autodesk and GRAITEC technologies to deliver real benefits to customers“. GRAITEC, an international BIM and CAD software developer for AEC, and Autodesk® Platinum Partner in US and across Europe, is excited to announce the international availability of it Reinforced Concrete BIM Designers, integrated with Revit®, among the mid-term R2 release of its Advance 2017 products. GRAITEC Advance BIM Designers is a collection of apps dedicated to streamlining structural BIM workflows, automating traditional design and modeling processes and speeding the production of technical documents. All have been enhanced in 2017 R2 introducing functionality based on user feedback. The Reinforced Concrete BIM Designers are an innovative rebar detailing and modeling solution which utilize engineering BIM data, and work to numerous international standards, automate the design and creation of 3D rebar cages and produce related documentation – design reports, drawings and schedules – for common concrete Column, Beam and Footing elements. Introducing a new addition to the GRAITEC Advance BIM Designer Collection, the Steel Connection Designer – for quick and easy design of a large variety of steel connections and integrated into Advance Design. Welded and bolted Moment End Plate, Apex and Haunch connection types are supported, simple to create and extremely detailed. Using the new ‘enable weld’ option quickly converts the joint to fully welded with verifications completed according to EN 1993-1-8 standards. The Steel Structure Designer works on both Advance Design and Autodesk® Advance Steel enabling an extensive range of building definitions to be configured in seconds. Several new options and commands have included to adjust the position of the reference axis in relation to elements, to accommodate both analysis and detailing, connecting all elements at the nodes. This also applies for purlins, side rails, roof bracings and side bracings. Users can now control the precise set-out positions of openings by aligning the frame elements to a reference point or system line. Finally new parameters have been introduced for a more accurate control of purlin and side rail distribution. Fast and flexible stair and railing modeling for Autodesk® Advance Steel. New options have been included for anchors and connector types, when detailing with straight or curved concrete support elements. When designing standard handrails, there is a new option to create the top handrail in a single element (polybeam) for accurate documentation, set-out and scheduling. All product downloads are available from the GRAITEC customer portal here. A free trial can be accessed here and GRAITEC apps and add-ons are also available as a free trial or to buy from the GRAITEC store. This version of GRAITEC Advance Design 2017 includes enhancements to ensure Advance Design works seamlessly with GRAITEC Advance BIM Designers, including the automatic transfer of geometry to BIM Designers. Settings can now be customized for local areas – set your own country, language and standards – to simplify the transfer of project information (project name, address, user data) from Advance Design together with any elements designed using Advance BIM Designers. A new addition to the Advance Design ribbon is the Bill of Materials button which automatically calculates an estimated quantity of materials and costs for your project. A new Fast Order Input table offers a quick and simple way to create new orders by entering data (eg; section, material, length, name and cut type) directly into a tabular format or copy directly from an Excel spreadsheet, to create standard parts. Advance Workshop performs error checking and transforms the list into an order ready to be sent to production. To assist with internal management, it is now possible to manually add, remove or adjust planning stages as well as change, rename or replace all part and assembly names from the Edit Order function. Additional fields have been added to the ‘New Order’ dialog to ensure the most precise information is collated and orders can now be easily filtered for quick loading and referencing. The PowerPack for Autodesk® Advance Steel already encompasses a wide selection of exclusive joints, tools and utilities for Advance Steel users, and earlier this year, introduced a range of new profiles for worldwide Cold Rolled systems manufacturers with a range of intelligent parametric Cold Rolled joints that automatically adapt to the selected suppliers preference for purlins, apex-ties and anti-sag systems. This range has been expanded. A new single command for 2017 R2, enables the creation of NC files in Advance Steel and exports them in an SMLX file which transfers seamlessly into Advance Workshop. Delivering more tools for architects, MEP and structural engineers, the 2017 R2 version includes improvements to the Numbering wizard with position tolerances that enhance the way elements positions such as grids are managed. The Pipe Openings tool for automatically inserting an opening where MEP elements interest structural elements, includes advanced searching and sorting. The rebar copy tool supports differing size elements, and the Bending Detail command now creates multi-rebar tags for rebar sets with multiple spacing in one single operation. Whilst ‘Clean and Refresh’ updates bending details to reflect changes in Revit® project. The Family Watermark Manager can manage multiple families at once, the Category Visibility tool can be used to switch on and off the visibility of either all categories or any elements in the current selection of the project. 3D View for each level creates views only for selected levels. GRAITEC, an international BIM and CAD software developer for AEC, and Autodesk® Platinum Partner in US and across Europe, is delighted to announce the launch of its new GRAITEC Advance Suite 2017, providing the very best modeling and design software solutions to the Architecture, Engineering and Construction market. GRAITEC has continuously strived to provide first-rate advancements for innovative software solutions to its valued customers, and the recent launch of its new and upgraded product range for 2017 is no exception, proving they are still top of their game in terms of providing top-level Construction, AEC and Building Design software solutions worldwide. GRAITEC’s flagship Finite Element Design and Analysis solution, Advance Design, has been enhanced to include full integration with the new GRAITEC Advance BIM Designer collection. The Steel Connection BIM Designer, Reinforced Concrete BIM Designers and the Steel Structure Designer integration enables advanced structural BIM workflows and next-gen process automation across disciplines and multiple platforms including Revit®. With a committed focus on improvements in managing steel projects, further updates include the use of Excel to enable tabular access and grid control as a way to easily modify the properties of structural elements, the ability to enable or disable structural objects for calculation, new load groups added to the Moving Load Generator and the possibility to create a rigid element with a single click without having to manually define a rigid section or material, resulting in a highly simplified workflow. Commencing with the 2017 version, North American users can benefit from a set bundle comprising Advance Design 2017 and Advance Design America 2017. Advance Design America includes the same expert structural analysis and design software, in-line with North American norms and standards. Users are able to install and use either Advance Design or Advance Design America. For further information, please contact one of our GRAITEC offices. After the successful launch of Advance WorkshopSteel Fabrication Management Information System last year, the rapid uptake and high demand has seen GRAITEC accelerate development to significantly improve native interoperability with Tekla and Advance Steel. Through embedding its BIM linking software – BIM Connect – advanced connected BIM workflows can be supported and connected to the fabrication process whilst Advance Steel users benefit from an extended profile management, which links directly with Autodesk® Advance Steel databases. A wider range of CAM Manufacturer’s new machine ranges are supported, whilst provision for smart phone integration can enable cost-effective rapid delivery and tracking of production, using bar codes. The support of Unicode characters and new languages expands the natural market for the product. Users can also manually tweak planning sequencing to improve project management. Additional features comprise new algorithms for importing irregular plate shapes, advanced waste-reduction nesting calculations, stock optimization, material traceability and Time Reader reports for utilization analysis, plus many new features to assist sales and management. The GRAITEC Advance PowerPack for Revit® 2017 is compatible with both Autodesk® Revit® 2016 and 2017 and comes with a range of tools dedicated to improving and speeding up the user’s daily experience when using Revit® software. New to this version, the BIM Data Link tool, which links Revit® and Excel, introduces new ways to share and reuse project data whilst uniquely retaining any colours, formatting, filtering and sorting applied in either platform. Two additional exciting new tools, highly requested by users of the PowerPack for Revit® are the Numbering tool and Impact Views Manager. The Numbering tool is incredibly powerful as it can be applied to any Revit® category or family detected in the active project, allowing the created numbering to be further used for tagging everything from rooms to doors and windows to MEP services to grids and everything in between. The numbering tool breaks the traditional boundaries, enabling combinations of active type parameters, prefixes and suffixes as well as grouping to be applied together with user interactive selection sequences or predetermined context sensitive algorithm-paths. The Impact Views Management tool enables complex views to be created which display both the active elements together with any hidden ‘impact-elements’ or load-bearing elements which may, for example, be above and/or below a selected slab. More unlike traditional workarounds which create static views that do not update, views created with the Impact Views Manager remain connected to the model and update to reflect any changes. Additional, notable MEP tools include Pipe Opening which detects all clashes between MEP services and Structural elements and allows openings to be applied in all instances on the fly or globally, based on user preferences. The tool monitors all clashes and manages the relationship throughout the project. Other MEP tools include a variety of pipe tags for naming and thickness. 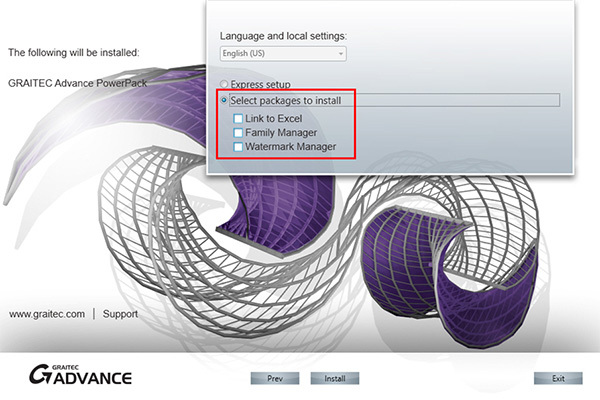 Enhancements have also been made to a number of existing tools such as the Family Manager, with the option to add network folders and many more. GRAITEC is an Autodesk® Platinum Partner in Europe and America and continuously develops its PowerPack to provide significant value to its Revit® customers worldwide. Compatible with Autodesk® Advance Steel 2017, the GRAITEC Advance PowerPack for Advance Steel introduces a wide selection of exclusive joints, tools and utilities for Advance Steel users. The PowerPack now includes new profiles for worldwide Cold Rolled systems manufacturers with a range of intelligent parametric Cold Rolled joints that automatically adapt to the selected suppliers preferences for purlins, apex-ties and anti-sag systems. These joints combine the functionality of over 15 individual joints to simplify the process of adding cold rolled systems to your projects, or even switching suppliers. Users are also able to select folded or flat plate cleats, stays or sleeves between two purlins. Other improvements can be seen in the commands to export parts to ACIS models and the folded plate extender which adds plates and folds along any selected edge of a plate. GRAITEC Advance BIM Designers are a collections of apps dedicated to streamlining structural BIM workflows, for automating the traditional design and modelling processes and the production of technical documentation, and are capable of working on multiple platforms. In this release GRAITEC expands its Advance BIM Designers Collection to include Reinforced Concrete BIM Designers and Foundation BIM Designers, both of which are available as a preview-release and expected to be commercially available after the summer. The Steel Structure Designer allows the user to quickly configure complete steel structures in a wide variety of shapes and is fully compatible with Autodesk® Advance Steel and GRAITEC Advance Design. The 2017 version now enables curved roofs to be created in either direction, with purlins that automatically align to the curvature of the roof – a notoriously tricky task to manage manually. This version also sees the introduction of a library feature, with save/load options, and predefined building configurations that instantly create structural buildings complete with bracing, railings, floor beams, platforms, door and window openings, and cladding in a few seconds. With options for controlling all aspects of setting out or designing a steel structure including column placement, floor management, bracing types, gables walls, openings, and even side rails and roofing systems, including cladding – which is instantly trimmed to the area and around openings and should alone save hours – and the ability to save and load your designs on the fly adding to the library, the Steel Structure Designer is a powerful building configurator that reduces modelling time to a fraction of the time compared with standard modelling practices. Steel Railing Designer 2017 (formerly Ball Post Railing Designer) is fully compatible with Autodesk® Advance Steel 2017 and sees enhancements to the existing Ball Post Railing systems, whilst introducing new railing types including standard railing and wall railing. One of the new key features of the Railing Designer is the ability to now place any railing along a simple line or polyline or even by fixed points, rapidly expanding the flexibility and capability of the system. The Ball Post module supports various user-defined or manufacturer-specific ball post railing systems, with the flexibility to create and modify kickrails, post lengths, handrail parameters, distance between posts, connections and more applies in all cases. The wall mounted railings will be a welcome feature by many users. New to the collection is the Steel Stair Designer which introduces the ability to configure Balanced and Saddled Stairs systems. These new additions to the BIM Designers Collection offer a glimpse of expected future capability and offer new levels of productivity for Autodesk® Advance Steel users. Traditionally, these are very complex or time-consuming stair configurations. Options for the balanced stair include single, double or central stringers from plate, flat or sections, automatically calculated winders with manual override, multiple tread types and complete control over the fixing. Equally applicable to the saddled stair: users can switch between double support stringers from section profiles, to saw-tooth plate stringers with cantilevered treads. New to the BIM Designer Collection, the Steel Connection Designer is an interactive connection designer for calculating common steel connections including Base Plate, Moment End Plate and Apex Haunch to Eurocode EC3. Supporting international design codes, the Steel Connection Designer is compatible with Advance Design 2017 and available as a preview release. With the ability to manage and calculate bolted and welded joints, and with fully detailed design reports that include the calculation formulas and reference to the design code, the Steel Connection Designer introduces a higher degree of accuracy. New to the BIM Designer Collection, and introducing radical changes including a high-degree of automation to traditional structural workflows, the Reinforced Concrete BIM Designers for Columns, Beams and Footings are compatible with, and integrated in Autodesk® Revit® 2016 and 2017, GRAITEC Advance Design and also available as a standalone solution. The Reinforced Concrete BIM Designers can be applied at any stage of the process to support multiple workflows from completely isolated process to a fully connected BIM. For example, the reinforcement generator which uses the FEM results to calculate the rebar, can be used to simply generate rebar cages based on user input. Equally, the user can apply estimated forces and use the Reinforced Concrete BIM Designers to produce the reinforcement cages for the entire project’s columns, beams and footings. Reinforced Concrete BIM Designers have been localized for Europe and are available as a preview-release, expected to be commercially available after the summer. If you would like try out the preview-release of the Reinforced Concrete BIM Designers please contact your local GRAITEC office or click here to request access. This powerful, free plugin for Autodesk® Revit® from GRAITEC provides bi-directional, intelligent Structural Building Information Modeling (BIM) model sharing, including the transfer of FEM results data, between GRAITEC engineering and fabrication solutions (Advance Design, Arche, SuperSTRESS, Advance Workshop, etc) and Autodesk® Revit® and Autodesk® Advance Steel products. BIM Connect 2017 is fully compatible with Revit® 2016 and 2017 and comes with improvements to synchronization control, retaining materials when section changes, definitions of circular sections by the radius or diameter and more. Important enhancements see improved transfer method of efforts from Advance Design to Revit® as well as ways to manage stacked walls, which are no longer exported from the Revit® model, creating seamless structural BIM workflows. GRAITEC, international BIM and CAD software developer for AEC and all round structural industry specialist, is delighted to deliver even more tools in the latest version of the Advance PowerPack for Autodesk® Advance Steel 2016. The new version of GRAITEC’s Advance PowerPack for Autodesk® Advance Steel includes a wealth of functionality and productivity tools to ensure customers achieve a true competitive advantage when using Autodesk® Advance Steel 2016. The latest version, which is in addition to all previous tools, introduces several new connections, tools for setting out complex helical stair stringers, links with cloud services and a suite of commands for transforming Advance Steel drawings into AutoCAD compatible versions, whilst retaining intelligent scaled and editable dimensions. GRAITEC customers receive the PowerPack for Advance Steel as a complimentary addition to their Autodesk® Advance Steel subscription and service contract, or it is available to purchase separately from GRAITEC or one of our global partners. Download a free five day trial from the GRAITEC website. GRAITEC, an international BIM and CAD software developer for AEC and Autodesk® Platinum Partner across Europe, is delighted to announce its new complementary extension to Autodesk® Revit® – Advance PowerPack 2016 for Autodesk® Revit® 2016. This impressive new application from GRAITEC for Autodesk® Revit®, provides a set of unique tools and functionalities for significantly increasing productivity and efficiency of Revit® users across all industries. GRAITEC Autodesk® Revit® subscription customers will benefit from complimentary access to the Advance PowerPack 2016 as part of their subscription contract, taken or renewed with GRAITEC, whilst others are able to purchase the Advance PowerPack for Revit® directly from GRAITEC or from one of their extensive partners worldwide. The Advance PowerPack 2016 for Revit® is available to download with a five day free trial, directly from the GRAITEC website. GRAITEC, an international BIM and CAD software developer for AEC and all round structural industry specialist, is pleased to announce the launch of its new GRAITEC Advance 2016 suite featuring 2 new products: a new powerful extension for Autodesk® Revit® and a new cutting edge steel production MIS system. Advance Workshop 2016 – NEW! GRAITEC is excited to launch Advance Workshop, its new Steel Fabrication Management Information System (MIS) designed to give steel fabricators complete control over every stage of production. This easy to use, purpose-built software manages stock, traceability, labor and CNC processes, making it adaptable to the needs of steel fabricators of all sizes and maturity. With direct links to Autodesk® Advance Steel, Advance Workshop offers a perfect complement to GRAITEC customers in the steel sector including full support for NC data from all major 3D steel detailing systems. Advance Workshop empowers steel fabricators with complete control of their business, it deciphers and visualizes production-rich data in a way that relates specifically to the services and capabilities of individual facilities, enables business owners to optimize fabrication sequences, increases production capacity and minimizes overheads. Click here for more information on Advance Workshop. 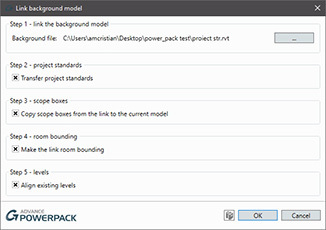 Advance PowerPack for Autodesk® Revit® 2016 – NEW! 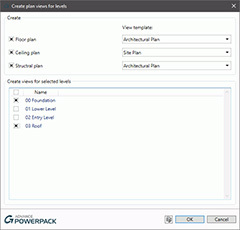 Advance PowerPack for Revit® is a dynamic new application, dedicated to Autodesk® Revit® users of all disciplines, offering an extensive set of unique, every-day productivity tools for faster modeling, simplifying and controlling annotations and dimensions, creating exploded 3D views of models as well as a number of utilities for direct importing of data from Excel and exporting directly to .dwg files. Another major offering is the integrated BIM Connect utility, which allows the seamless sharing of BIM models between Autodesk® Revit® and Advance Design which supports the transfer of building performance and analytical results data, promoting a more intelligent BIM workflow between engineers and designers. GRAITEC is now an Autodesk® Platinum Partner and with much more planned for future versions, Advance PowerPack for Revit® will deliver significant value to its Revit® customers worldwide. Click here for more information on Advance PowerPack for Autodesk® Revit® 2016. This new version of GRAITEC’s Advance PowerPack for Autodesk® Advance Steel significantly expands the exclusive functionality and unique customer-centric toolkit offered by GRAITEC to its maintained users, whilst integrating bi-directional links with Advance Workshop and introducing cloud connectivity. 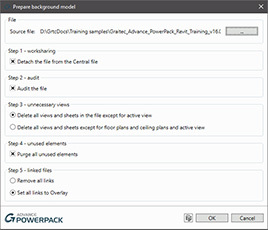 Advance PowerPack 2016 for Autodesk® Advance Steel 2016 adds a wealth of localized manufacturer profiles and default settings, as well as new tools for creating splines of complex helical stair stringers, tools for automatic creation of floor coverings to standard grating sizes, improvements to many of the existing tools with new functionality and strategically, the introduction of a bi-directional link with Autodesk® Advance Steel and Advance Workshop that allows users to retrieve and graphically display production data in real-time, which can be published to the cloud for access in the field. Click here for more information on Advance PowerPack for Autodesk® Advance Steel 2016. GRAITEC’s Advance Design 2016 comes with a brand new ergonomic ribbon-based user interface making it easier to navigate and access tools more efficiently. This version also introduces US, Canadian and Polish design codes together with a EC8 German appendix expanding the reach of Advance Design to additional global markets. New design tools were added for rigid diaphragms for slabs and reinforced concrete ribs design. To support an even more intelligent BIM workflow, the bi-direction link between Advance Design and Autodesk® Revit was updated to enable the sharing of BIM models containing building performance data, including support for transferring the actual FEM results to the Revit® environment. Click here for more information on Advance Design 2016. Visit the GRAITEC website for more information on these detailing and design solutions.